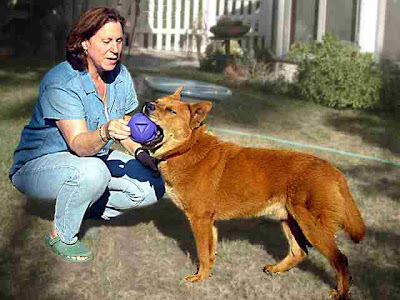 Leslie has a big soft spot in her heart for lost or injured animals. That's how she got me. Also several of our cats. A few weeks ago she befriended a friendly, limping dog that had been abandoned near the double-wide where her laboratory has been temporarily moved. For a while she thought she could find a good home for him. But it soon became clear that she wanted to keep the puppy for herself. We voted on it. The vote was one to one. I lost. He's fairly large and a red color. 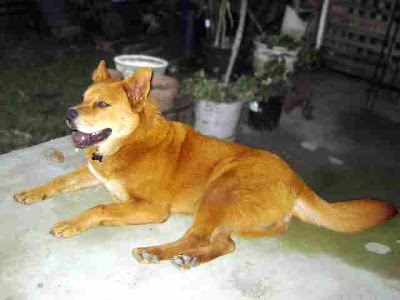 A mixed breed, obviously part chow. She named him Chowderhead. She regrets this now because I've insisted on keeping that name. She calls him Chowder or Chow-Chow or Ch-Chow. But I know that his name is really Chowderhead..
By coincidence our handyman is doing some maintenance tasks at the moment. Instead of those important jobs he's built fences so our back yard will securely hold a canine-type creature. Tonight is Chowderhead's first night with us. In just a few hours Chowderhead has managed to get himself sprayed in the snout twice by skunks. And he also broke into the house through the screen door and chased a cat across the house and into my office. Yep, we have a lot of new experiences to look forward to, here in dog and cat land. A family of skunks living under the house. Leslie took this picture one night ago. They're gathered around a ceramic pig which holds a succulent that sits just inches from our back door. Right across the street from us, high in a magnolia tree, a pair of hawks is raising their young. We've heard the chicks but have seen only the adults. There are also recent raccoon and possum sightings. Cute little baby opossums and big raccoons standing on their hind legs. We haven't seen a coyote in a long time. If we lived closer to the mountains we might see black bears. Southern California television stations always cover bears who swim in backyard pools. 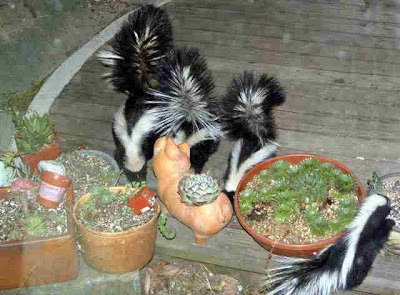 Here's a previous Mixed Meters post involving a skunk.